The 47th annual Friends and Family Camp Week has come and gone. The last of our guests has driven out. Staff members have put away the kayaks and canoes, sailboats and paddle boards. The outboards are out of the water. The tennis nets are down. The kitchen staff is busy cleaning out freezers and refrigerators. It’s leftovers for one last lunch. It’s a sad day – but a beautiful one. It’s warm and the lake beckons, though seems much quieter. We had a banner year this year at Friends + Family Camp. Every cabin was occupied. With our late father, Mike, not here – we simply did what we had to do. We stepped up on the bench of the Doc Monilaw dining room porch and filled his shoes with ours. Andy, Ross and I were no funny-one-of-a-kind Mike – but we were still full of caring, and this was enough. We found that Highlands is still Highlands, and that the ever present void left by Dad’s absence was not something so powerful so as to steal our joy. Camp is still here – if not on an ascent. Thank you, Dad – we saw you all summer – in the breathtaking rainbows and moments of pause. We remembered your specialness so many times, and in so many ways. One of my first campers, Rob Rousseau (Cabin 23, 1985), was here with his two sons. Who do you think taught them to water ski? It was David Kuesel, the son of Artie Kuesel. Artie taught Rob how to ski – now 30 years ago. Others had the same experience, perhaps with Kent Overbey teaching their children at Adventure. We had 34 alumni on the Peninsula with their respective friends and family. They were universally surprised by the number of faces they knew! In 1963, Norvil Beeman made a decision. It was yes or no – to sell camp to a 23 year old staff member named Mike Bachmann. Norvil’s answer was yes, and the rest is history. Those of us at CH this summer have Norvil to thank. In fact, this was true more than ever as Norvil’s extended family was with us for a family reunion. Daughters Dottie and Marty were with us – stars of their clan. Memories, reflections, and gratitude for Norvil and his wife Cleo were recorded. Thank you, Beemans! Tonight, we will take the post camp staff out to dinner. For me, it is one of the highlights of the year. Despite the fact I wasn’t here for Boys Camp, I love these men and women. They have worked SO HARD! They are true Highlands! We will dine at the Clearview Supper Club on Big St. Germain Lake. It will be a wonderful night full of reflections, stories and laughter. Most of all, it will be night full of appreciation – for the beautiful North Woods, each other, and Camp Highlands. 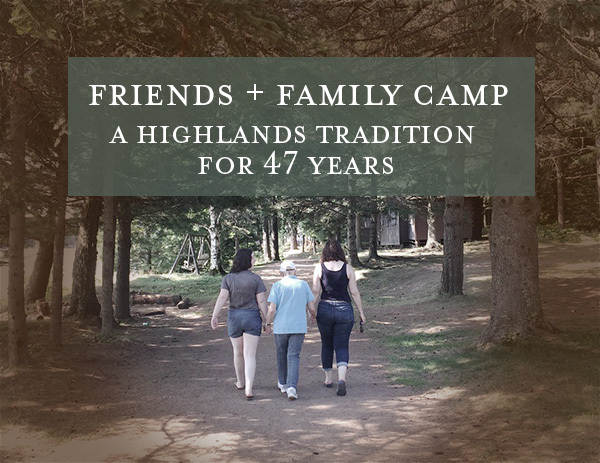 There will be a bittersweet feeling we already feel in our hearts – the realization that another beautiful, happy season at Camp Highlands is over. Check out the photos on the gallery of all the fun we had. The password can be requested by emailing tracyb@camphighlands.com.